This is my favorite way to cook most veggies. It’s simple and it lets the vegetable’s flavor shine. Just prepare the vegetable, in this case the romanesco by cutting in small pieces. For the romanesco, cut at the base of each floret to keep it looking pretty and put in pan. Put about 1/2 inch of water in the pan and lots of olive oil drizzled over the top of the romanesco. Add 1 teaspoon sea salt and freshly ground pepper. No need to stir yet, just put the lid on and turn on to medium-high heat when ready to cook. Bring to a boil and reduce heat to medium. 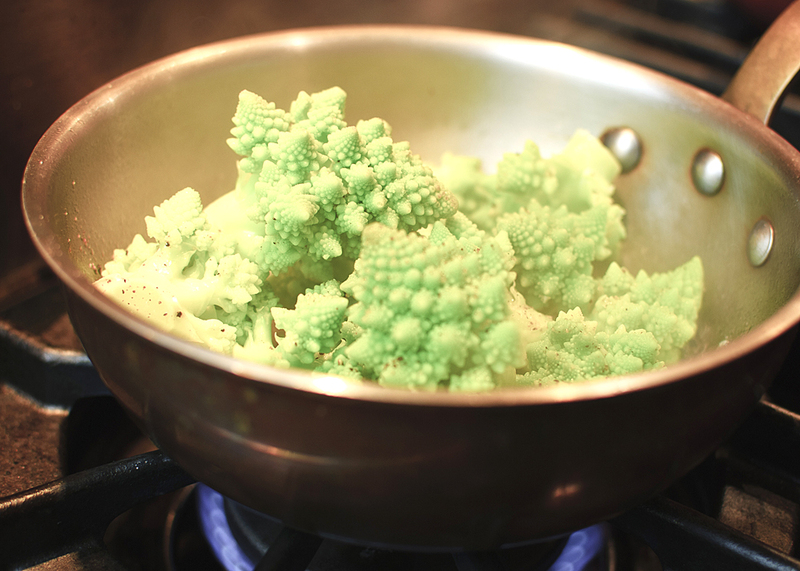 Cook until romanesco is tender-don’t overcook! There’s nothing worse than mushy vegetables, so check often after about 5 minutes. These are usually done in about 10 minutes. Take off lid and stir gently to coat romanesco with the oil, salt and pepper that’s in the pan. This entry was posted in sides and tagged romanesco, sidedishes.